At the end of March 2019, two partners of the 5G-EVE project participated in a meeting of the ETSI Industry Specification Group (ISG) on Multi-access Edge Computing (MEC) in Madrid: Telefónica (member) and UC3M (participant). The Multi-access Edge Computing (MEC) initiative is an Industry Specification Group (ISG) within ETSI, the European Telecommunications Standards Institute. Its purpose is to create a standardized and open environment, which will allows the efficient and seamless integration of applications from vendors, service providers, and third-parties across multi-vendor MEC platforms. The 17th plenary meeting of the ETSI ISG on MEC took place in Leganés, Spain at the Universidad Carlos III de Madrid (UC3M) on 25-28 March 2019. Taking advantage of this meeting, UC3M and IMDEA Networks organized a visit to the 5TONIC laboratory, one of the four sites that the 5G-EVE project is interconnecting to create a unique 5G end-to-end facility. 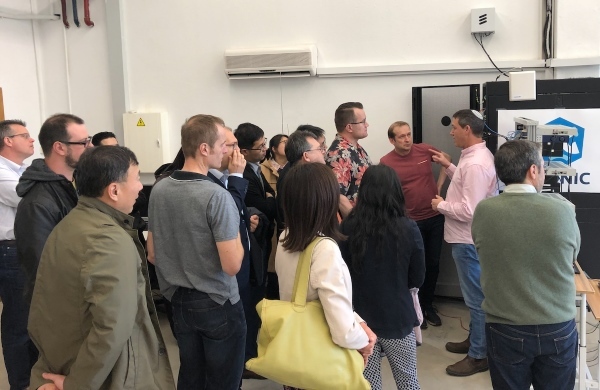 Around 30 people representing operators and vendors like Vodafone, China Mobile, China Unicom, KDDI, ZTE, Intel, NEC, and Nokia visited the lab. They were shown the laboratory facilities, and a demo of 5G-EVE’s Industry 4.0 use case. This demo, carried out in cooperation with 5G-EVE partner ASTI Mobile Robotics, uses MEC to provide the low latency required by the centralized control unit of Automated Guided Vehicles (AGVs). Apart from the mentioned 5G-EVE partners, three members and collaborators of 5TONIC – Intel, InterDigital and Saguna Networks – are also MEC members. Through them, the knowledge obtained in these experimental activities can be reported to the standards defined by ETSI.